MINNEAPOLIS — For Anthony Davis and Karl-Anthony Towns, Monday was a night of 20s, as in 20-point, 20-rebound games. On Wednesday, Davis and the New Orleans Pelicans will visit Towns and the Minnesota Timberwolves. It will be the 10th head-to-head meeting for Davis and Towns, who both played a year at Kentucky. 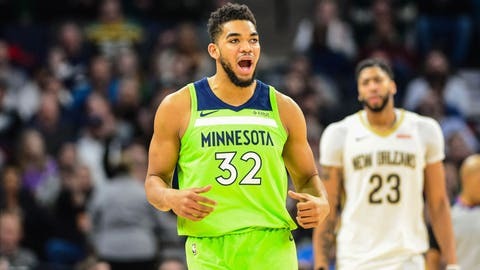 Davis is 5-4 in games against Towns and is averaging 30.2 points and 9.1 rebounds. In two of those matchups, he scored 42 and 45 points, respectively. Towns is averaging 19.2 points and 10.8 rebounds in his head-to-head meetings with Davis. The most recent meeting occurred Feb. 3 in Minnesota. Davis scored 38 points, but Minnesota claimed a 118-107 win. Both Davis and Towns are coming off big nights for their respective teams. Davis totaled 25 points and 20 rebounds in Monday’s 126-110 win at Toronto, which was unbeaten at home. It was Davis’ fifth career 20-20 game and the Pelicans are undefeated when he gets a 20-20 game. Towns totaled 25 and 21 in Monday’s 120-113 win over the Brooklyn Nets in a game where he also committed 10 of Minnesota’s season-high 23 turnovers. It was his sixth 20-20 game, but the Timberwolves are 2-4 in those games. Davis and the Pelicans enter at 7-6 after halting a five-game road losing streak. The Pelicans also are on a three-game winning streak and are allowing opponents to shoot 40.1 percent (112 of 279). In the last two games, they’ve held Phoenix’s Devin Booker and Toronto’s Kawhi Leonard to a combined 11 of 32 from the floor. “We just had to get back to it,” Davis said. “We lost five in a row on the road and we’re a better road team than that; we are a good road team. Towns helped the Timberwolves halt a five-game losing streak and improve to 4-9. After losing by an average of 14.6 points on a winless five-game road trip, the Timberwolves began a stretch of 10 of 12 games at home by shooting 52.5 percent. Monday’s win occurred after Minnesota officially dealt Jimmy Butler to Philadelphia. The Timberwolves received Robert Covington and Dario Saric in the deal and both players are expected to be available Wednesday. It’s possible that Saric could start at forward for Taj Gibson and Covington will likely be a reserve. Saric averaged 11.1 points while starting each of his 13 games for Philadelphia. Covington averaged 11.3 rebounds and also started each of his 13 games. Both Davis and Towns had support Monday and the big men hope to get similar help again Wednesday. E’Twaun Moore supported Davis with a season-high 30 points with 20-of-28 shooting from the floor in his last two games and Jrue Holiday matched season highs with 29 points and 14 assists. Julius Randle added 17 points, and in his last four games he is shooting 63.2 percent (31 of 49). The Pelicans were without Elfrid Payton and Nikola Mirotic, who both sat out with a sprained right ankle. Payton has missed the last eight games. Mirotic has sat the last two. Both players could be out again. Towns was aided by Jeff Teague, who returned from missing six games with a left knee contusion and finished with 24 points and 11 assists. Derrick Rose also added 23 points in his first home game since getting 50 points against Utah on Oct. 31. The Timberwolves swept the four-game season series from the Pelicans last year. Before the sweep, New Orleans won 10 of the previous 12.